Ducktales (2017) Average 5.00/5 - out of 1 total votes. 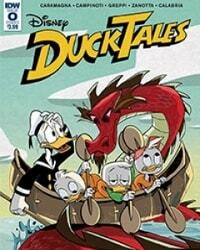 DuckTales (woo-hoo) returns! Featuring beloved characters like Uncle Scrooge, Donald Duck, and Huey, Dewey and Louie, this new #0 issue is the perfect jumping on point for fans old and new in anticipation of the brand-new series coming Summer 2017! Experience the wackiest, quackiest hijinks in two brand-new (Duck) Tales!